The big bottle is alcohol-free, essential oil infused On Guard mouthwash and it is my new obsession. Seriously, I had run out for a few days and I was freaking out over my oral health. Why? Because I see HUGE benefits from using this mouthwash every day. You only see me unpack one bottle here but I actually ordered two bottles – I couldn’t even wait to do this short video and blog post to start using it again. It’s now one of my MUST HAVE products. It also rates super well if you look up the ingredients in the Environmental Working Group database. 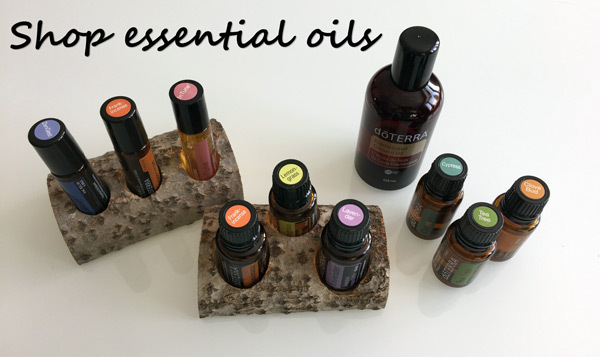 So now for the oils… I won’t explain all the different uses for these oils – because there are tons! – I’ll just cover what I used these for. Clove: incredible antioxidant; good for oral health (Health Canada approved for internal use). Bergamot: love diffusing at night for bedtime; on an emotional level, it’s an oil that helps provide confidence and self-esteem. It might sound crazy y’all but it works for me! Lemon: an all-around great cleanser. What don’t I use lemon for? People also love it for the skin but make sure you avoid the sun for at least 12 hours if you apply it topically. Geranium: this is another great one for the skin. It’s in the skin moisturizer I make. I like putting a drop over my heart when I need some emotional support. I’ll mix this with Clary Sage and apply topically for respiratory relief (and my beau loves the smell of this combo on me). Black pepper: honestly, I’m just low on this one and not too sure why. It’s used a lot in pain blends. Arborvitae: I love the smell of this one (think: wet cedar) so I diffuse it a lot with a citrus oil and flowery oil. I like to put a drop under my feet as a tonic. Voilà! That’s my November health products restock.